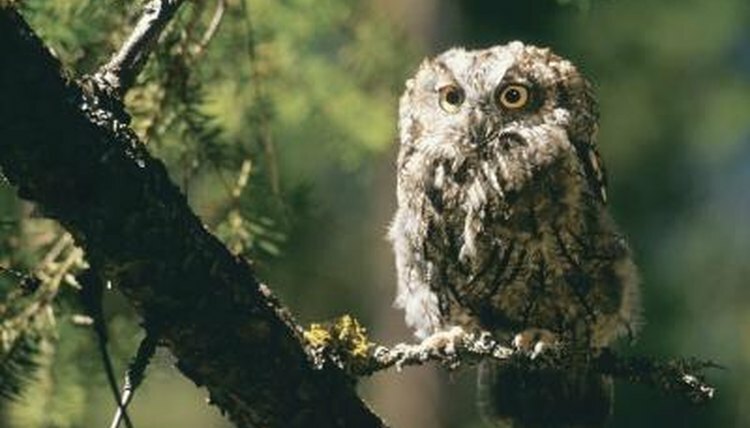 Screech owls live in habitats such as woodlands, swamps, forests and river valleys. These birds nest in abandoned animal-made tree holes or natural tree cavities, coming out at dusk to hunt for small mammals, insects and other birds. Examine a screech owl's appearance and behavior to identify the raptor's gender. According to the Science Museum of Minnesota, telling male birds apart from female birds is typically as simple as identifying feather color differences. Males are often brighter than females. However, screech owl feather color is no indication of gender. Size is a noticeable difference between male and female screech owls. According to the Loudoun Wildlife Conservancy website, females are 9.2 inches tall on average and weigh 7.3 ounces. Males grow to 8.2 inches tall and weigh approximately 7.0 ounces. Females also have larger wingspans of 22 inches; males' wingspans are 21 inches. Male and female screech owls form permanent bonds together for reproduction. Female birds lay between two and eight eggs per clutch. Females do the majority of incubating, while males are responsible for hunting and bringing back food for his mate and her offspring.